You’re probably wondering, “What do shoes have to do with Maleno building homes, renting apartments, and selling real estate?” Read until the end and we’ll tell you. 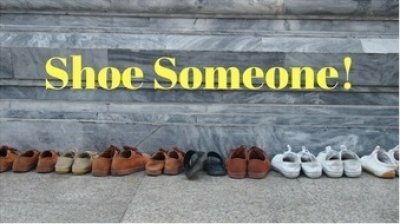 . .
Today is National Shoe the World Day. It’s estimated over 500 million people around the world do not have a single pair of shoes to wear and are left to walk barefoot. Other than choosing the appropriate color or style for the day, most of us don’t think about our shoes once we put them on for the day. Can you imagine having to traverse snow-covered mountains, rocky roads, or desert sands in bare feet? How about walking through the rain and snow in the city of Erie? It’s real. And it’s not just happening “somewhere else”. It’s right here in our own neighborhood. While many of the “national” days are frivolous and fun, this one carries a very practical, very real mission. At Maleno, we believe it is our duty to give back to the community in which we build homes, whether it’s helping people with housing needs through the Maleno Family to Family Fund or donating to worthy causes. Beginning today through April 30th, we will be hosting a collection box for shoes and clothing to help support our local, needy families. At the end of our collection drive, we’ll deliver the goods to the Veteran’s Miracle Center Erie. Drop off a gently used or new pair of shoes (and/or clothing) at our Property Management office located at 2315 Jamestown Dr. We’ll share a cup of coffee with you! For a complete list of requested donation items, click here.